Do I have the correct engine for my BGSH? 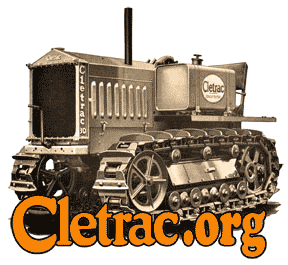 Cletrac.org > Cletrac Tractor Discussion > All Models Except HG, OC-3, OC-4 & General > Do I have the correct engine for my BGSH? I have a Model BGSH serial # 8C960 built in 1946, I don't know what engine was in it originally, I am replacing it with a Hercules model JXC and am wondering if this is the same engine? thank you for any help you can give me. Re: Do I have the correct engine for my BGSH? The original engine was a JXD engine. It has a bigger bore than the JXC. Both engines will fit, but there are two kinds of JX engines. Those with 3 timing gears and those with 5. Cletrac used the 5 gear engine and it has provision for the governor the 3 gear engine does not. Look at the front gear cover on your JXC, if it is wider than the block on both sides it is a 5 gear engine, if only on one side, a 3 gear engine. You could use a 3 gear engine but you would need to install some kind of belt driven governor or a foot gas pedal! Thanks for the information Robert I will check and see which engine I have. Checked the JXC last night and appears to have the wide front cover with the governor on one side and water pump on the other. Now I just have to figure out how to get 6 ext. valves out. Mice have gotten in the ext. manifold some time over the last 50 years. It hasn't been going very well. We took the JXC engine out of a 27 Massy Harris Combine. That is good that you have the correct engine set up. Do you have the old engine? You will need the bellhousing from it. This is just a flat plate that is between the engine and clutch housing, it is unique to the Cletrac. Zimmerman Oliver-Cletrac may have one if you need it. Yes I have the bellhousing that is correct. I did get all the valves out today I had to use heat to loosen them up and then slowly push him out with the lifter adjustment. Now I will start working on getting the Pistons loose which I don't think are stuck too bad. The old engine was toast but I do have all the parts that came with it. I have the engine completely disassembled and the block and associated parts are at the machine shop. Question, I get an error when trying to open paint codes. What is the correct paint color and is the engine same color as the crawler? I'm not sure if it will work, but if the pistons from the JXD are good, you might be able to have the block bored to fit them. Decided to put the jxc engine in aside from the valves needing attention the rest of engine looks good. It will probably will not see hard work again.